I have mentioned before that my husband is a Finn, he was born and raised there and then moved to America with his family when he was 19 years old. It is funny that not until I married a Finn have I ended meeting so many Finnish people. I met Niina over a year ago through a Mother's club that we both belonged to. She had arrived a little late at one of the groups activities and our kids were playing on some play equipment. I heard her talking to her little boys in a foreign language that to me sounded Finnish and she looked Finnish with her blonde hair and Nordic features. So I asked if she was from Finland and sure enough she was. I then told her my name and that my husband was from Finland and our little friendship began. It was really cute that day to watch my son and her son communicate with each other in Finnish. My husband tries to speak only in Finnish to the kids and my son who is the oldest understands pretty well although he responds in English, but he knew basic words and was able to play and communicate with Max no problem. Earlier this year Niina asked me to make some Toy Story cookies for her son Max's birthday. Then for her other son, Dan, she asked me to do a cake and some cookies. Dan's theme was Moomins. I know most of you have no idea what that is so this is what wikipedia has to say... Moomins are central characters in a series of books and a comic strip by Swedish-Finn illustrator and writer Tove Jansson. Some characters are trolls some are hippo like animals. 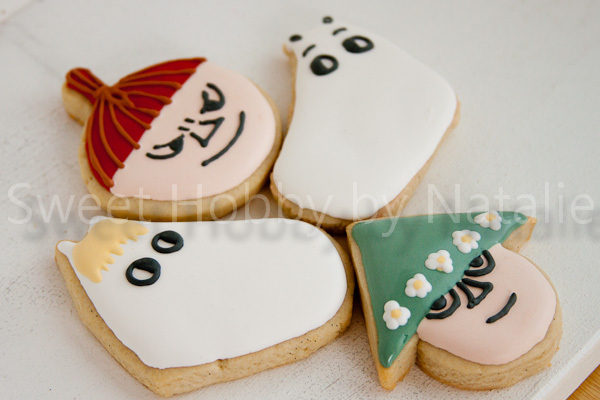 In the cookies below there are four characters from left to right their names are..... Pikku Myy, Niiskuneiti, Muumipeikko, and Nuuskamuikkunen!! 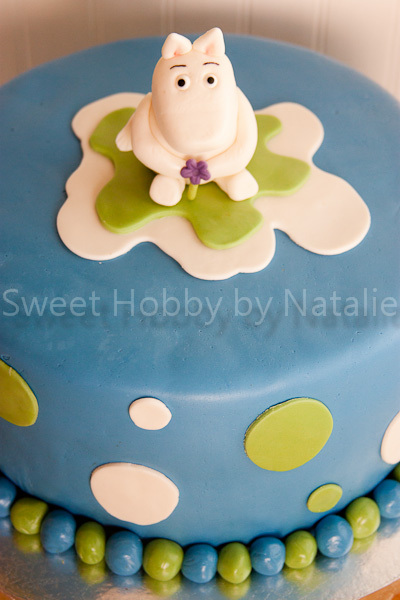 Here is Dan's cake with the Muumipeikko character on top. 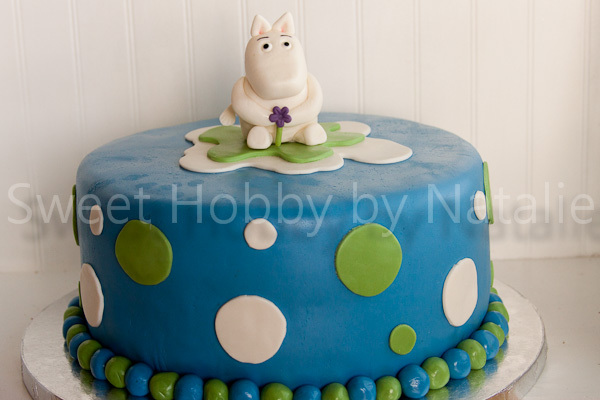 I googled Moomin cakes and was led to Swedish or Finnish blog by Tartsmulan. She has some great cakes on that site. I hope she does not mind me using her design. And one more shot, I love the little tail sticking out on the left side. I sure hope that Dan had a great time and that he enjoyed his cake and cookies! The cake was a chocolate cake with raspberry cream filling, covered in white and dark chocolate ganache then covered in butter-cream marsh mallow fondant.